EARTH MAZES by Alex Champion, Ph.D.
Dr. Champion introduces you to mazes and labyrinths including a brief history of labyrinths as symbols and their relation to earth mysteries and dowsing. The second half of the book is a tour through mazes Champion has made throughout the United States. It is a 46 page book filled with 18 mazes and symbol drawings, 18 photos, 11 in color. Self published in 1990. ChowChow Imamoto wrote this book to share with you self healing procedures, which are simple yet immensely effective. These techniques help you balance the radiant healing energies of your body, mind and spirit. 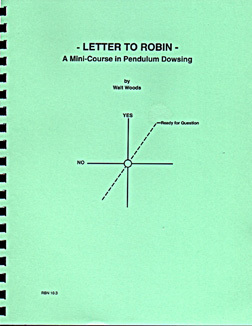 A Mini-Course in Pendulum Dowsing. What is Dowsing? Dowsing is the ancient art of finding water, minerals, and lost items. It can be used for personal questions, business decisions, and other kinds of inquiries. To dose is to be actively intuitive. Walt shares his expertise and knowledge of the fundamentals of dowsing.